It has been said more than once just recently and with good reason too that a week is a long time in politics but if that is the case, then Gaoth Dobhair ended an absolute eternity of waiting for Donegal yesterday. 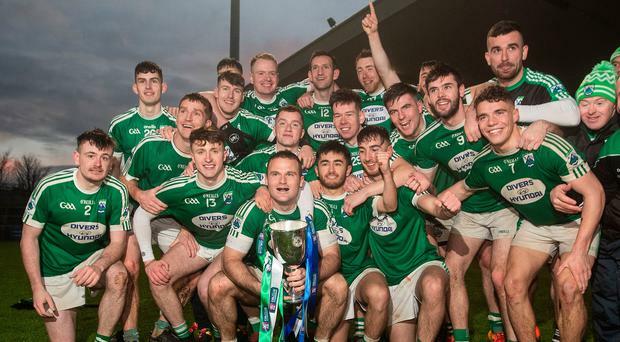 Not since 1975 has the Ulster Senior Club Football Championship resided in the county and it was perhaps fitting that the team which achieved that feat should have been among the guests of honour at Healy Park, Omagh yesterday when Gaoth Dobhair were crowned provincial kingpins. It was tough, tense and tempestuous but in the end the north west side managed to scramble across the line following a frantic contest. In difficult conditions, Gaoth Dobhair had players who stepped up smartly to the plate with Odhran MacNiallais inspirational at midfield, Daniel McBride the perfect link between defence and attack and Eamon McGee a defensive pillar throughout. A first half that was pock-marked with too much lateral hand-passing was followed by a pulsating second period that ended in deadlock, thus sending the game into extra-time before substitute Shane Ferry flighted over the winning point amid tension that was all but tangible. Gaoth Dobhair skipper Niall Friel may still be only 22 but he revealed a level of maturity both during and after the game that belies his rather tender years. "We knew it was going to be tough and so it was. But we have more belief in ourselves now and I am so glad that we lasted the pace. Scotstown were always going to be difficult opponents and we knew we would have to dig very deep to get over the line," said Friel. But while Scotstown manager Kieran Donnelly conceded that his team had been unable to close out the game, he took considerable exception to the red card shown to his top scorer Shane Carey in the ninth minute of extra-time. "I couldn't believe it. I thought it was an innocuous challenge to be honest and I saw that as a big turning point," said a devastated Donnelly, "These players are very committed and I thought they worked really hard but certain things tended to go against them on this occasion. "But I know my players are made of stern stuff and they will be back again in search of the Ulster title. Right now they are very disappointed, though." The sides were deadlocked at 0-5 each at the end of the first half of normal time but when Carey (2) and Conor McCarthy whipped over three quick-fire points on the resumption, Scotstown appeared to be taking command. But with MacNiallais imposing himself strongly in midfield and Kevin Cassidy showing up well in attack, Gaoth Dobhair regained their momentum and when those two players and Naoise O Baoill pilfered further points, the Donegal side were right back in contention. And they were to stay there, too. It was after substitute James Carroll and the ubiquitous Carey had piloted Scotstown into a 0-11 to 0-9 lead, that the hugely influential MacNiallais landed a point from a free and another from play to leave the sides level at 0-11 each at the end of normal time. It was after Rory Beggan landed a trademark point from a '45' that referee Noel Mooney showed Carey his red card and from then until the end Scotstown were swimming even after Eamon McGee did not help the Gaoth Dobhair cause by incurring two yellow cards that led to his dismissal. But Ferry proved the hero for the Donegal champions when he deftly pocketed a golden score that was to spark scenes of joyous celebration when the final whistle sounded shortly afterwards. By John Campbell Donegal manager Declan Bonner could yet enjoy a double boost ahead of his team's Ulster Championship quarter-final against Fermanagh. By Chris McNulty Michael Murphy delivered one of his best ever performances to inspire Donegal to the Division Two title. A 12-point second-half turnaround from Donegal at Páirc Uí Rinn kept alive their Division 2 promotion hopes and left Cork on the brink of relegation to the third flight. By John Campbell He may be only 22 years of age but Gaoth Dobhair skipper Niall Friel provides the kind of leadership that could see his side reach the All-Ireland Club Championship final tomorrow.